We are visiting at the end of March 2015. Will the Frozen Sing Along still be on then? Does anyone know how long the Frozen sing along will be at hollywood studios and olaf snow adventure? 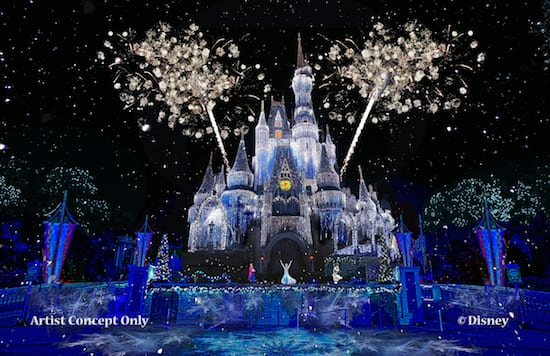 Will Elsa transform Cinderella’s castle at Disneyworld only or Disneyland as well? We are going late Dec. through Early January to celebrate our 15 yr. Anniversary. I really wish it will be open during our stay. Will Cinderella still be appearing for the lighting of the castle or will it just now be Elsa on stage? For all us nostalgics We would love it if you guys would heavily document rides that are going to disappear and possibly make videos for us of the whole ride-thru with views behind the scenes and lighting that we could never get trying to shoot with our own equipment. Some of us also love pieces of the attraction to view at special events and to purchase possibly in the form of piece of disney attraction pins retired edition. Using pieces from main characters. Also we love seeing pieces appear in other attraction 😉 As for frozen, don’t rush make it awesome and cold. 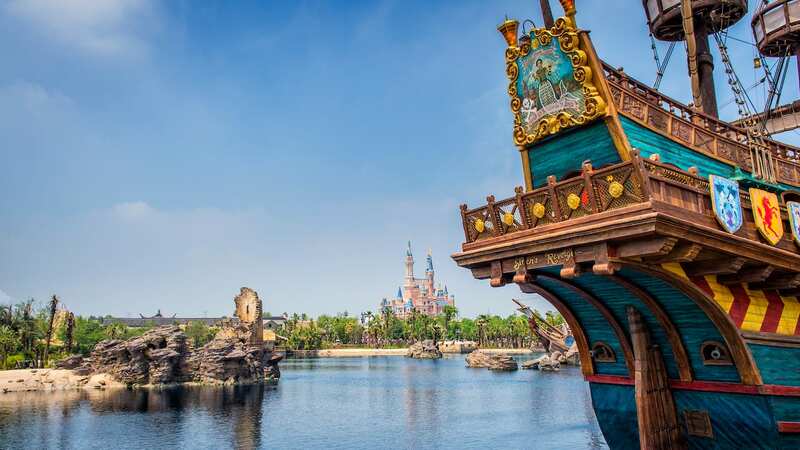 Please don’t get rid of the boats and the short drop (similar to Pirates of the Caribbean). In other words, change the scenery but don’t give us another ride where we sit in a two-seater like so many others. I enjoy the boat ride in Maelstrom as-is. Will the fireworks be continuing? I’m heading to the parks in October! Please confirm the fireworks either way, need to know???? Hey Tom, any chance we’ll be able to see some concept art or ride details soon? I know that would be helpful and hopefully ease concerns about replacing Maelstrom and staying true to Norwegian culture! I’m very sad to see Maelstrom go, but I am also very excited for a Frozen themed ride. I am very hesitant about this change. I hope it’s not just an overlay. The imagineering team never disappoints- but Maelstrom is dated and deserves a re-do, just not sure about Frozen being in the World Showcase. I use a power wheelchair and do not transfer onto rides. I have been to Walt Disney World 17 times because of the accessibility and attention to those who are unable to use a standard ride vehicle. I do not know if you are using the same track system or not for the new Frozen ride, but if you are doing something all new please consider a wheelchair accessible ride vehicle similar to Toy Story Mania, The Little Mermaid, Winnie the Pooh, Figment and others. I would love to enjoy this new ride like everyone else. When can we hear news about a Frozen ride in Disneyland? Not at this point, but we’ll continue to look for opportunities for guests to enjoy Frozen at Disneyland Resort as well. Will the ride still be on a boat? I would like some elements from the Maelstrom to stay. I know I will miss it, but I would take a Frozen ride any day! As much as I love Frozen, the Maelstrom is a childhood memory. I love that ride. I’m soooooo sad to see it go. Please tell us if the fireworks will continue??????? It’s not that I don’t think Frozen is great, but Maelstrom is my favorite attraction at Walt Disney World and Norway is my favorite pavilion at Epcot. Can’t frozen replace something else? Epcot won’t be the same for me. Are the gift shops still going to be the same? I love the Helly Hansen and Laila and always look forward to a purchase from the shop on each visit. Sometimes too much of good thing, is well, just too much. I too love the movie but will very much miss, Malestrom and Epcot getting away from fact and going to fiction/fantasy. I agree with Annette. I would LOVE to be able to ride this new Frozen ride. I don’t care where you put it as long as I can ride in my wheelchair. I can not transfer! There are very few rides at Disney Parks that I can ride in my wheelchair. But you know what? Disney Parks is the ONLY place that even considers making this happen. So thank you very much for that. I would LOVE to be able to ride Peter Pan, Haunted Mansion, Spaceship Earth, POTC and see the animatronic sections of Splash Mountain and the Mine train ride but I could never go on those. This is why its so important that you make this Frozen ride accessible for all ages and abilities to enjoy. Just got back from an 11 day trip and I just love what the additions of Frozen have brought into the parks, such a difference since our last trip in 2012. When we got to the Norway pavillion we were pleasantly surprised to see the Frozen display and when riding Maelstrom I distinctly remember whispering to my husband as we floated through the ride, “what if Elsa and Anna were right there?? Why DON’T they do that?” Imagine my surprise that night while watching the local news from our Pop Century room: “Frozen ride making it’s way into Epcot!” We looked at eachother with wide open eyes! Of course, it just makes sense! I also want to add that the Frozen fireworks go down in history as one of my top 3 favorite Disney fireworks.. Please keep it! I agree with Scott and Jennifer on their last two comments, the movie was great but i don’t think this kind of attarction belongs in the world showcase, they dont have Milan within China at Epcot. It should be history and culture. I will miss the old ride. Wow. So sad to see Maelstrom go. I was hoping to ride it in late October. Definitely the best ride in World Showcase. Also really sad to see that World Showcase is moving away from it’s non-fiction style. WDW (and Disneyland!) definitely need Frozen rides; I just don’t think this is the way to go about it. I’m so sad. I was honestly looking forward to it so much. I understand that it’s important to keep the parks moving forward and fresh, and I definitely want to see new attractions in all four parks. I also enjoyed Frozen, and my five-year-old daughter is a huge fan. I just wish that it wasn’t going in Norway and replacing Maelstrom. EPCOT has been my favorite park since I was a kid in the early ’80s, and I want to see it get more attention. My hope is that the Future World attractions will also get the necessary upgrades in the next few years. I agree with Max, it would be awesome if Disneyland were to receive a Frozen ride. Will there be any news about increasing the “Frozen” presence at Disneyland? Just booked FP+ for the Frozen sing a long on Nov 4th. At that time, could you please tell me if it will be at it’s current location or moved to where American Idol is? It makes a difference in our plans. Thanks. Maureen, the Frozen Sing-Along will be at its current location at the Premiere Theater at Disney’s Hollywood Studios. Early 2016? So I’m guessing it isn’t just a “redressing” of Maelstrom? When I read your original post I was foolishly hoping it would be ready by our February 28, 2015 visit. Happy the Frozen sing along will be continued and we will surely be posing with Anna and Elsa! Any chance they will be appearing at the Princess breakfast at Akershus? It seems like a perfect fit. Terrible to see maelstrom go especially with such a short timeline of it closing….Facebook posts on Disneyworlds page says it all. Is there a possibility of a Frozen ride also coming to Disneyland in California? In Fantasyland possibly? Or can you not give away too many details yet? UPDATE! We are heading to Disney in late October. I went online today and to my shock, I was able to get fast passes for the Frozen show in Hollywood Studios! That means they must be extending it! If you are going in October 2014, go online and check for fast passes on the show! So excited!!!!!!! I am disappointed in the change at Norway. The World Showcase has always been about the countries and their traditions. I rather see the rides stay in the other areas. Did I read correctly that the Frozen Singalong will be indefinately? We are coming for spring break. Kids will be so excited for the singalong. Will there be anything else in March besides the singalong? Yes, Tim, you read correctly. We’re extending the Frozen Sing-Along indefinitely. 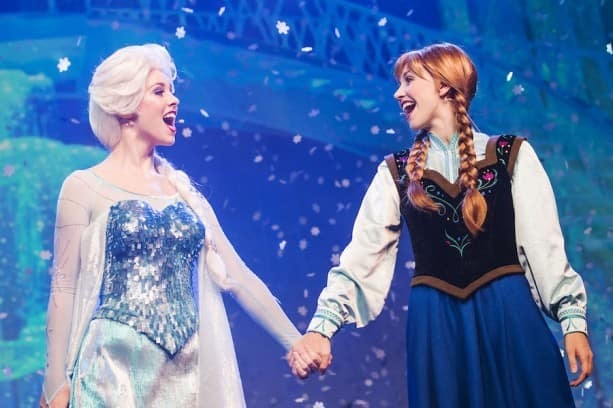 We’ll also have plenty of other opportunities next spring for your family to experience Frozen at Walt Disney World, including seeing Elsa and Anna at the Magic Kingdom in Disney’s Festival of Fantasy parade and at Princess Fairytale Hall. Losing Maelstrom is very Sad news to me. It is my favorite attraction in all of World Showcase. It’s exciting to hear we are getting a Frozen ride here at WDW, it’s just a shame that Maelstrom has to be sacrificed to get it. I want both! I will greatly miss Maelstrom…. Any chance Elsa and Anna will join the Royalty lineup at Akershus Royal Banquet Hall? I’m liking all of this especially the Elsa/Ice Castle it’s just perfect. And oh while on the subjet of Epcot, please reconsider Off Kilter. It’s like ending the Voices of Liberty. Just. Not. Good. I am highly disappointed in this news. The Maelstrom is a classic World Showcase ride that tells the story of Norway. In my opinion that is the point of The World Showcase. I’m not against a Frozen Attraction but feel this is the wrong place. My love of The World Showcase has been that it’s different than Magic Kingdom. This is a Magic Kingdom ride and IMHO belongs in the overall Fantasyland area. With all the land Disney owns I don’t understand why they have to add new rides at the expense of classic rides. This is brilliant! Can’t wait to experience the new attraction. I can’t wait to ride the frozen in 2016! I love Frozen! I am going to miss the Norway movie that was shown at the end of the ride. Does Disney have any plans to put these retired films on DVD?